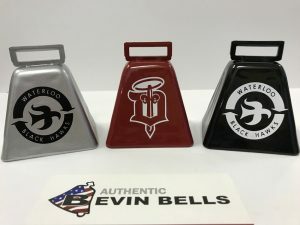 Bevin Bros > News > Custom Bells for Events > It’s Chime for Some Hockey! Hockey fans are a fanatical bunch and they know how to cheer for their team!! I know – I grew up as season ticket holders for the Johnstown (PA) Jets (immortalized in the movie “Slapshot”, where they were called the Charlestown Chiefs). Talk about a fanatical fans… As the temps drop in the fall, we start hearing from the hockey teams getting ready for the season, and it brings all those fun memories flooding back! 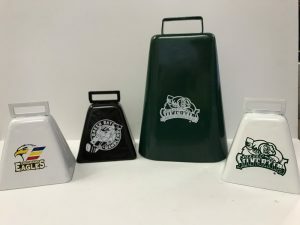 Our cowbells make great cheering props and even better souvenirs and keepsakes, so I know the fans are still as fanatical. We sell bells to teams across the country in all sizes and shapes. 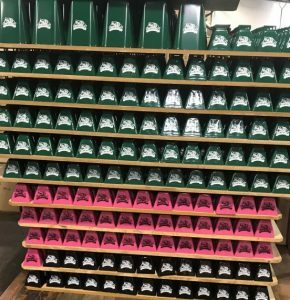 From our Long Distance Cowbells – which range from giant to middlin’ to our Kentucky Bells – a bit softer tone but still a range of sizes, down to our souvenir and ornament bells which make great key chains and holiday ornaments. This entry was posted by Cici Bevin in Custom Bells for Events, Work Samples. Hey, that’s my Kolzig ringing his cow bell. Thanks for making him famous. Haha.